I’ve been excited to share this one with you. Many years ago we were given this old Coke machine. It was in our backyard for years and years and we just used it as an ice chest. The past 10 years, since we moved to a new home, we have just kind of hung onto it. It collected dirt, leaves, old shingles and whatever else my sweet hubby decided to dump on it. I didn’t have the heart to get rid of it. I’m sooo glad. This chest style coke machine is circa 1953. When we got it the sliding mechanism was still inside but we removed it in order to use it as an ice chest. 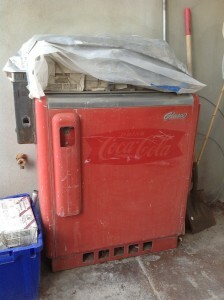 That turned out to be okay because in renovating it we decided it was not worth the money to completely restore it to working condition because you can’t buy bottled coke anymore, at least not for a price that would be practical to refill; especially for all the Coke lovers in our family. Well, as we were (are…..still) finishing our basement I decided I really wanted to incorporate this vintage contraption into our décor. When I mentioned this to a friend she told me her other friend had taken a metal door that she wanted repainted to an auto body shop and they painted it for her. We thought it was worth a try. The guy at Tip Top Auto Body was great. He painted this just the way we wanted. The next thing to do was find the decals. 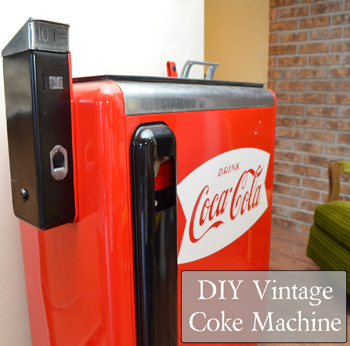 I found a fun website http://www.fun-tronicsllc.com/ that has all the vintage Coke parts, decals, memorabilia, and other vintage machines you can think of. We were able to order the original looking “fishtail” Coke decal and a couple other parts we needed. Although, not the cheapest reno we have ever done, it turned out just exactly the way we wanted. And we use it to store our vintage 1970’s vinyls! You know, Doobie Brothers, Elton John, Bread, The Guess Who……….we have had so much fun! Sooo glad we didn’t get rid of those either! I guess there are SOME perks to my pack-ratting darlin’! This has been one of our favorite projects. P.S. The cute little “made-to-look-vintage” record player sitting on top was a gift to my sweetheart for his birthday last year.